"This is my favorite side dish that goes great with chicken or fish or served over rice or pasta." Heat olive oil in a large skillet over medium-high heat; saute zucchini until softened, 5 to 10 minutes. Season zucchini with oregano and basil. Add tomato sauce; cook and stir until heated through, about 5 minutes. 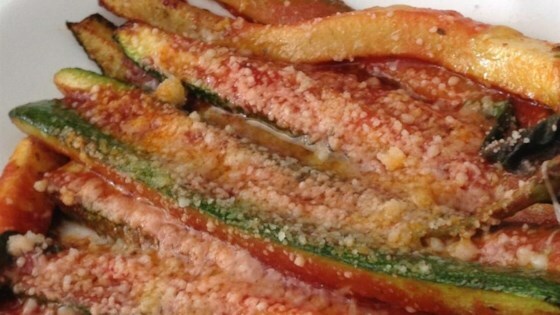 Sprinkle Parmesan cheese over zucchini mixture. This is wonderful and so easy to make. I did add some fresh chopped garlic to the recipe! This is simple and wonderful. I've made this a couple times. Quickly becoming our go-to veggie side with Italian food.